It may strike some as odd, but the importance of Jesus’ messiahship in Galatians has long been minimized by certain parts of Pauline studies. These scholars assume that when Paul uses the word Christos in regards to Jesus, it functions basically as a proper name, emptied of most, if not all, messianic content (p.3). Wright rhetorically takes the view of these writers and asks, “Why… would this letter, warning Paul’s gentile converts against the attractions of Judaism, make use of such an obviously Jewish notion as messiahship?” (p.3). As one might expect, Wright intends to show that Jesus’ messiahship actually occupies a central place in Galatians. Wright finds “the widespread and diverse Jewish practice of retelling the single ancient biblical story” to be an important piece of historical context for understanding Galatians (p.5). Whether we look at the covenantal narrative of Deuteronomy 27-30, Psalm 105, or prophetic literature like Ezra 9 and Daniel 2-9, he argues that we can find the same basic story being told from richly different perspectives (pp.5-6). Wright claims that, “Works such as the Animal Apocalypse in 1 Enoch and the historical visions of 4 Ezra and 2 Baruch tell the same story from different angles, as do some of the Qumran documents” (p.6). Keeping this in mind, we can see that in Galatians 3-4 Paul is also retelling Israel’s story, with Christos being the one who both enabled the fulfillment of God’s promises to Abraham and accomplished the long-awaited, new exodus of God’s people (p.13). Wright notes that, while reading any other Second Temple period text, “if we found a passage promising a new exodus and highlighting the role of one man as instrumental in bringing it about, this would probably be the Messiah” (p.11). There is no reason not to reach the same conclusion in Galatians. Given that Paul makes similar (and greater) claims about Christos, referring to Jesus, Wright declares that “it is ridiculous to say that he [Paul] did not mean the word [Christos] to carry this meaning, or that this meaning was merely residual but theologically irrelevant” (p.11). 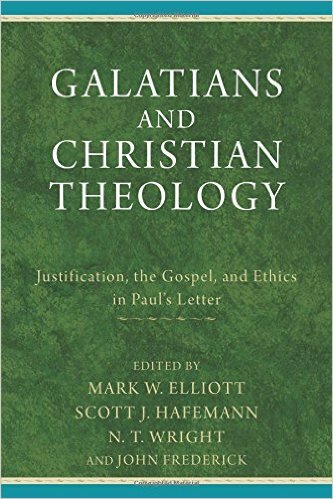 Thus, to treat Christos in Galatians as merely a proper name for Jesus is to miss crucial aspects of Paul’s conception of the significance of Jesus’ life, death, and resurrection for the Galatian believers. This entry was posted in Book Reviews and tagged Book Reviews, Galatians, Messiahship, N.T. Wright, Paul by joecrow91. Bookmark the permalink.